As a lifelong fan of all things Batman and an admirer of some of Telltale Games‘ previous series, I was more than a little excited to experience its take on the Batman universe. When Telltale’s Batman launched a few months ago I was initially enamored with its vision of Bruce Wayne and Batman and felt the series started strong. Unfortunately as the episodes progressed some of the casting and design choices as well as some story points fell very flat and the series lagged. 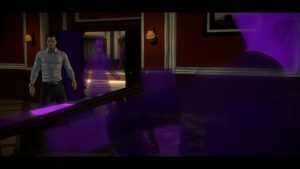 The fifth and final episode is now here and I can say that Batman – the Telltale Series has more lows than highs, despite ending with a fairly strong episode. 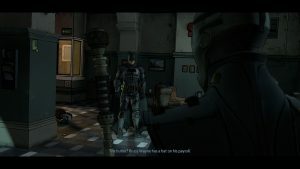 The premise of Batman – The Telltale Series is to show both sides of the character, giving equal focus to Bruce Wayne and Batman in. As the series progressed choices and actions were carried out as either Bruce or Batman; in fact in a few instances you could choose who would solve the next challenge. I like this twist. If a gentle personal touch were needed, Bruce Wayne was the choice; if a strong presence and some violence were needed, acting as Batman was the right move. The models Telltale created for both Bruce and Batman were also pitch-perfect, reflecting a refined vision of Bruce Wayne and Batman in stylistic detail. The casting of Troy Baker as Bruce/Batman was also well executed; a talented and versatile voice actor, he added nuance to the character which brought it further to life. Unfortunately there were more mistakes than successes in the modeling and voice casting in this series. Selina Kyle/Catwoman and Alfred Pennyworth are well represented and voiced, but James Gordon, Penguin, Two Face and Joker are all terribly voiced, and the models range from completely wrong for the character to plainly ridiculous. Harvey Dent/Two Face is a major part of this series. His character model is bulky and oddly represented, and his character comes off whiny most of the time. Penguin is tall and lanky and just never fit the mold of what is expected of the character, a huge shift since all the other characters more or less stuck to their archetypes. The Joker and to a lesser extent James Gordon suffer from terrible casting that completely pulled me away from identifying with the characters. It may sound like nitpicking, but though they were so perfect with Batman/Bruce they were so wrong elsewhere, really disrupting the flow of the game. As to the core gameplay, once again there are highs and lows. 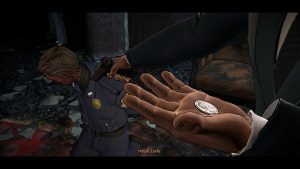 The big issues I had came from the absolutely terrible port Telltale made for the PC. Random crashes, hitching and stuttering in the gameplay, long load times, and an odd and sporadic checkpoint system all detracted from the enjoyment of the game, especially the dynamic fight scenes. This is a shame, because the series contains some truly interesting ideas. The detective scenes where Batman links clues to recreate what happened were fun, if not very complex. The fight scenes as well were well represented and had some of the best animation in the game, but as mentioned, hitching and stuttering took me out of the experience. I should also note that many times the animation in the non-dynamic scenes was very poor and seemed quickly slapped together. From a story perspective it is also a mixed bag. There are some strong notes around Bruce Wayne’s journey, but these are marred by stunt-like story twists. The Penguin taking over Wayne Enterprises, and the identity of Lady Arkham as well as Thomas Wayne’s criminal past were all odd story choices at war with the series’ otherwise traditional take on Batman and Bruce Wayne. I am all for switching up the story and trying something new, but a lot of the key story moments felt akin to clickbait articles – look at what outlandish thing we are doing now. Add this to my sheer annoyance with Harvey Dent every time he was on screen and the story fell mostly flat with me. I do have to say that some of the aspects revealed in the final episode are very well done, and at least partially redeemed the overall story arc for me. 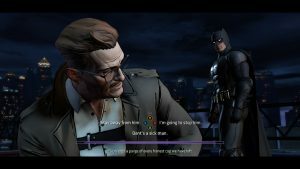 In the end Batman – the Telltale Series ends up a game with huge potential that fails to achieve anything spectacular. The PC port is particularly painful to experience at times, the graphics and animation in the very old engine leaves a lot to be desired, and weak story twists and some bad casting further degrade the experience. There are some good ideas in the game and the representation of Bruce Wayne/Batman is one of the best that video games have to offer, but that’s not enough to make this more than an average experience at best, and that is a true shame for this Batman fan.